This is one of a series of blog posts from the third ONA class of MJ Bear Fellows, three journalists under 30 who are expanding the boundaries of digital news. Applications are open to apply for this year’s fellowship until June 6. Fellow Ashley Lohmann is a media entrepreneur and founder/director of Beyond the Bombs. “For the first time in history, true global citizenship is possible,” said former YouTube Director of Product Hunter Walk, addressing a room full of furiously tweeting digital enthusiasts at the 2013 Future of Media Conference at Stanford’s Graduate School of Business. As social media and digital technology have become increasingly ingrained components of our lives, we are often warned about the dangers of becoming “too connected” and letting our digital relationships overshadow our in-person interactions. But the digital space can also enhance our human connection. My own work relies on the power of digital media to build cross-cultural bridges, specifically between the United States and the Middle East — two regions whose shared history has been marred by conflict and political tension. 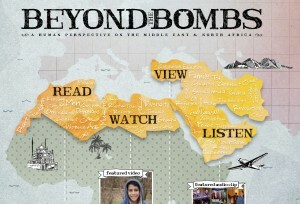 In late 2012, I launched an online multimedia storytelling platform called Beyond the Bombs (BtB), which showcases the untold stories of the Middle East and North Africa (MENA). We publish articles, photos, videos and audio clips from and about the MENA region that highlight aspects rarely seen in the news. We also aim to humanize the adversity that does make the headlines. BtB offers a space where visitors can connect with a region largely inaccessible to them through mainstream news stories about violence and conflict, and where its citizens can share “their MENA,” meaning media from their own perspectives. I am often asked how I became involved in such a niche issue. My academic and professional background is in terrorism and security in the Middle East. When I launched BtB, I’d just moved to Los Angeles from Washington, DC, where I had been working as an analyst on Middle Eastern security issues. So, what brought me to digital media, and how did I become interested in looking beyond the bombs when I’d spent my career focusing on them? It all started with a salsa dance class. I was an undergrad studying abroad in Istanbul, where I joined a student dance group. After an hour of practicing fancy footwork, we headed to a salsa club near Taksim Square, the center of the city’s nightlife. The club was packed with salseros, and I learned that it was only one of at least a dozen such clubs within a few block radius. Just like that, I had discovered a vibrant salsa scene in the heart of Istanbul. Each time I returned from subsequent trips to the region, I encountered similar reactions. Friends were relieved that I didn’t “get blown up” in Jordan; family members were stunned that I willingly traveled to Egypt. And the fact that I’d enjoyed my trips was practically unthinkable. I faced comparable surprise from people I met in MENA, who were impressed that as an American, I spoke Arabic, however poorly. When I showed interest in them and their experiences, they were surprised that I cared. With each trip, the disconnect and misperceptions became increasingly apparent to me. I realized that no matter what steps were taken politically, the tension would persist unless something changed on a people-to-people level. I wondered if there was a way to capitalize on the power of ordinary citizens to influence international relations. I found it in digital media. I started BtB as a simple blog to highlight parts of the MENA region that would be as surprising to my family and friends as the existence of salsa dancing in Istanbul. I wanted to show that there was more to the region than violence and conflict. With the support of the MJ Bear Fellowship and several cross-cultural programs, I assembled a team that has since transformed the blog into the crowd-sourced multimedia storytelling platform that it is today. As digital media continues to grow and influence our lives in new ways, I hope that we will become “too connected” in a good way: emerging as “true global citizens” who recognize our similarities, respect our differences, and feel that we belong. Fellow Ashley Lohmann is a media entrepreneur, and founder/director of Beyond the Bombs. Since graduating from Stanford University, she has held positions as a Middle Eastern security analyst in Washington, DC and an editor and writer for an online publication in Los Angeles. She has also studied and worked in Egypt, Jordan, and Turkey.